WYSIWYG stands for “What You See is What You Get” and is a term usually used in relation to website editors. However, it’s also an appropriate term for the visit I paid to the International Geneva Motor Show 2013 in March this year, because after strategy meeting, seminars, roadmaps, discussions with car manufacturers, suppliers and the silicon industry, this is where you really see what the public can get and whether the strategies and promises have been implemented (a KPI for the organiSations in question?). So here’s a summary of the brief visit. The first fact is that DAB+ digital radio in cars is now a reality. Compared to two years ago, many more manufacturers have solutions, and vendors are aware of what DAB+ is. 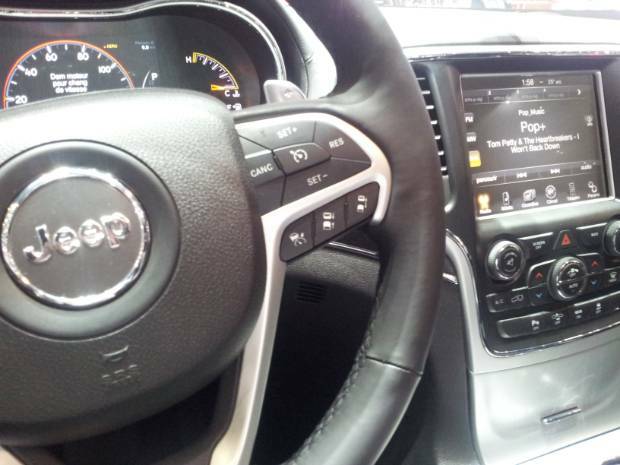 It is still generally offered as an option, often alongside navigation systems or other advanced infotainment systems. Talking with vendors, however, who are generally the ones advising buyers about the options, it seems that they often lack knowledge about what digital radio really offers. 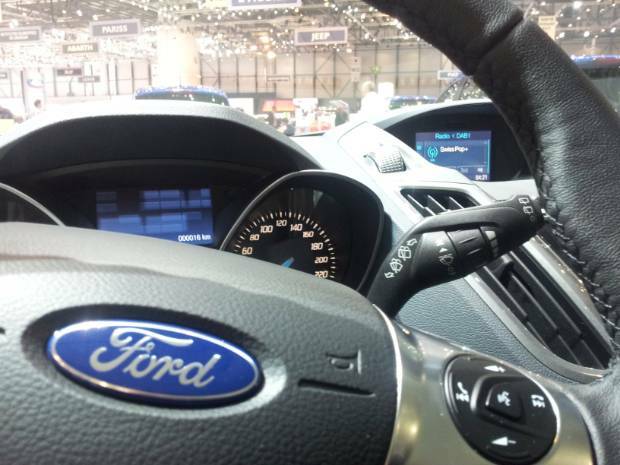 Ford is among the manufacturers with digital radio available as an option on all models. Manufacturers with digital radio offered as an option on all models: VW, Audi, BMW, Mini, Mercedes, Land Rover, Porsche, Volvo, Ford. The price of the option ranges from €120 (basic) to €1,100 (advanced navigation/multimedia). It is interesting to note that Audi now also propose Digital TV (DVB-T) reception on some of their models. Manufacturers offering it as an option on some models only: Fiat, Jeep, Toyota, Lexus, Mazda, Honda (in series with some models), Seat, Skoda, Opel, Chevrolet. 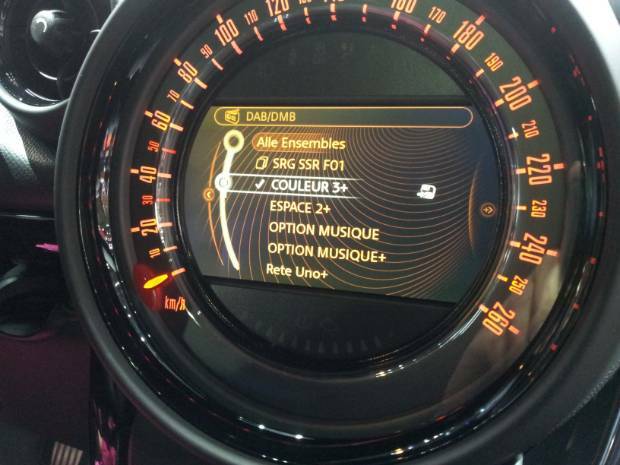 Manufacturers having no DAB+ option: Renault, Citroën, Peugeot, Suzuki, Subaru, Nissan, Smart, Lancia, Alfa, Hyundai, Kia (DAB but no DAB+), Infinity. 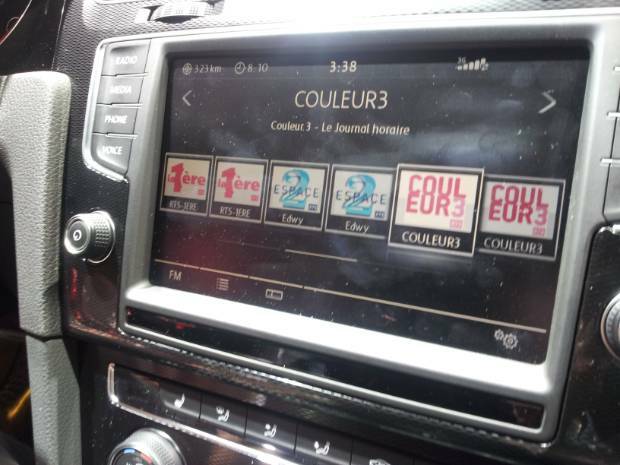 It’s interesting to note that Qoros, the new Chinese manufacturer, was aware of the recent EBU recommendation for radio distribution in Europe (R 138) and is planning to include DAB+ for cars sold Europe. For this category, buyers can just wait and use aftersale equipment (external DAB+ devices connecting to the car radio via wire, Bluetooth or FM). 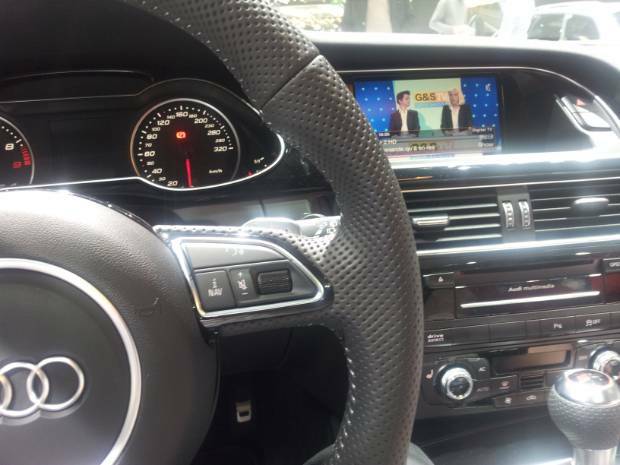 Audi makes DVB-T digital television available on some models. Looking at digital radio features, all models display text services (DLS, or Dynamic Label Segment) and some of the German models have the ability to display visuals (slideshow). The ability to record or pause live radio is another feature found. All seem to implement service following (DAB-DAB, DAB-FM). However none of the models I saw seemed to have TPEG advanced traffic information decoding. We can conclude that a lot still needs to be done at all levels to promote digital broadcast integration in cars, to break the chicken and egg situation by putting forward services. We have to make an effort with suppliers, the car industry (a role for organizations like WorldDMB or the EBU) and vendors (a role for local promotion bureaus like MCDT, Digital Radio UK, etc). The hybrid radio approach must also be promoted more heavily, in particular tagging, which is a non-distractive functionality (an important aspect when it comes to cars). And things tend to evolve slowly in the car industry, so there is no time to waste! There’s a lot of buzz around the concept of ‘Connected Cars’. However looking more into the details, we find many open questions around, for example, the presentation of the information, support of apps, who gets the subscription, where the SIM card is (car or phone), safety. Most of the time, interactivity comes via a Bluetooth connection with the owner’ smartphone. Connected cars offer a lot of promise for hybrid services. A workshop on connected cars organized by the ITU, ISO and IEC took place during the press day at the Motor Show on Wednesday. Standards, safety, security and privacy issues are high on the list when considering internet-connected cars. How far should the connectivity go? (Should it allow updates on car engine controls ? Collection of data on driver habits? And where are the standards?). In comparison to the mobile phone industry it seems that the auto industry is conservative and not very keen on things like app installations. The EBU was pleased to have the opportunity to participate in a panel discussion at the workshop, emphasizing the importance of broadcast media in cars and the possibilities offered with the hybrid approach. This is certainly a domain where the EBU can have an impact in partnership with the standardization bodies. This entry was posted on May 9, 2013 by WorldDAB in Automotive Industry, Benefits of Digital Radio, Content and Services, Digital Radio Rollout, Europe, Events, Internet and Hybrid Radio, Marketing, Receivers, Technical News.